By Jeffrey L Sebastian, M.D. 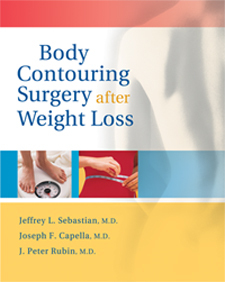 Jeffrey L Sebastian, M.D., Joseph F. Capella, M.D., J. Peter Rubin, M.D. Are you among the tens of thousands of people who have lost a massive amount of weight? If so, congratulations! You did it. Those years of struggling and failed diets are behind you. Perhaps you did it through weight loss surgery. Or, perhaps it was through diet and exercise. Either way, you have created a new life for yourself. But, now that the weight is gone, you are likely left with extra skin hanging from your new body. It likely causes you embarrassment and perhaps hygiene problems as well. However, body contouring surgery can help restore a more natural look to your body. How soon after surgery can excess skin be removed? How many surgeries will you need? Will you have much pain after surgery? When can you return to work and resume physical activity? What about fees? Will insurance pay?